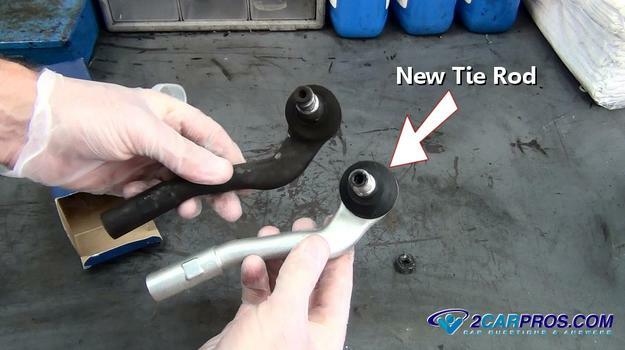 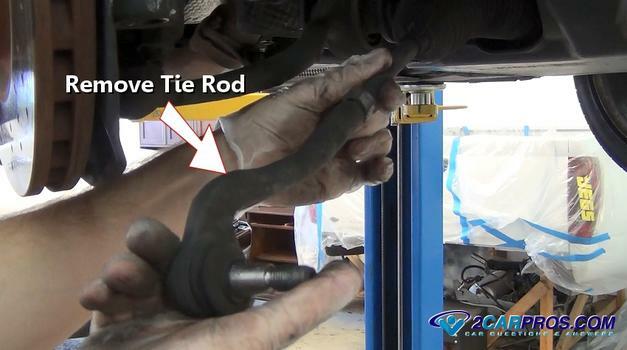 Easy step by step guide on how to replace an automotive steering tie rod, though appearances may vary the process is similar for most vehicles. 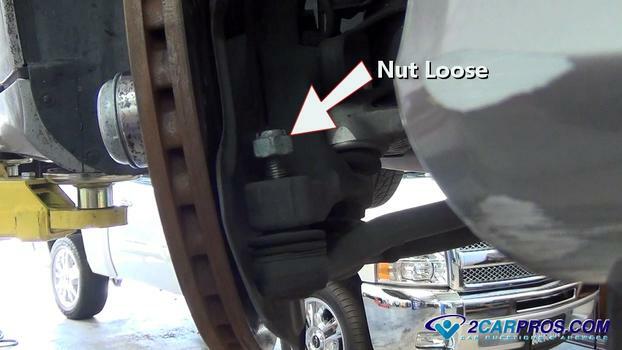 Begin with the vehicle on level ground, safely lifted using jack stands, engine off (cold) with the emergency brake set. 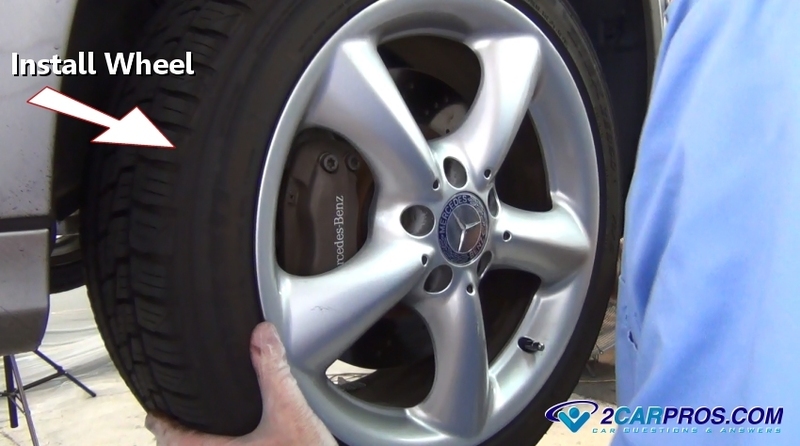 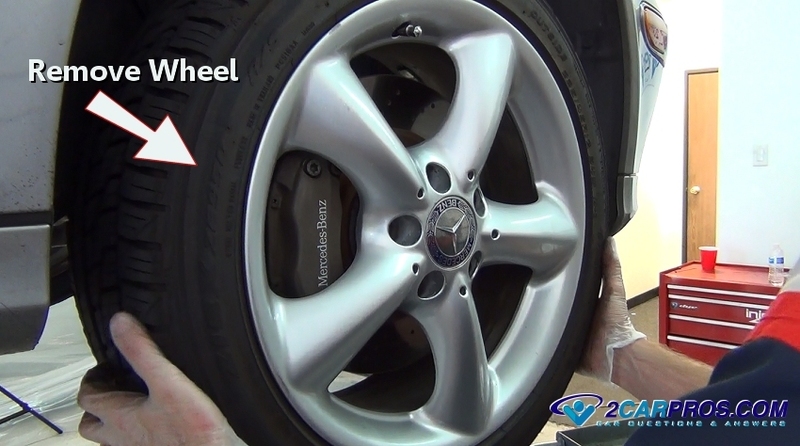 Step 1 - Once the vehicle is safely lifted, remove the lug nuts, if a manual wrench is used break the lugs loose while the vehicle is still on the ground, it will hold the tire from turning. 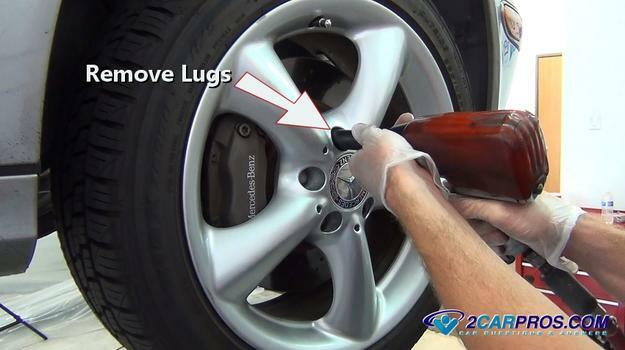 Step 2 - After the lugs have been removed, firmly grasp the tire and remove it. 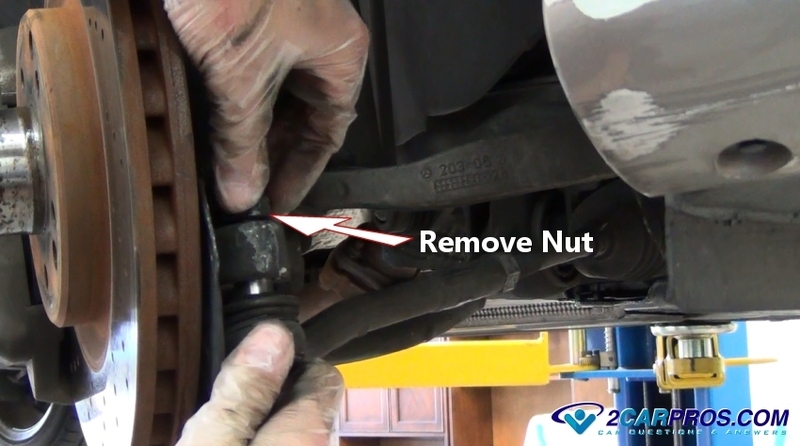 Step 3 - Use a wrench or air impact to loosen the tie rod nut at the spindle, leave the nut "ON" to protect the threads and hold it in place during removal. 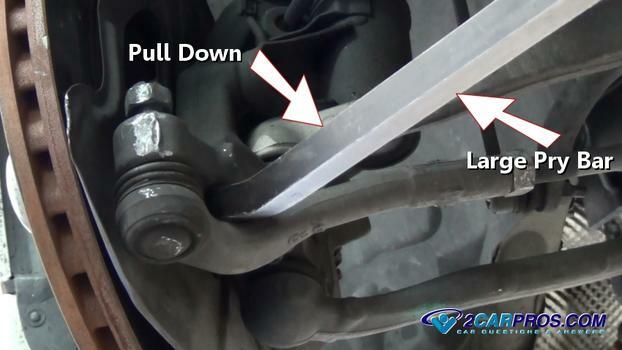 Step 4 - Because the tie rod is being replaced it doesn't matter if the threads get damaged while removing, but its good practice while working with steering and suspension parts. 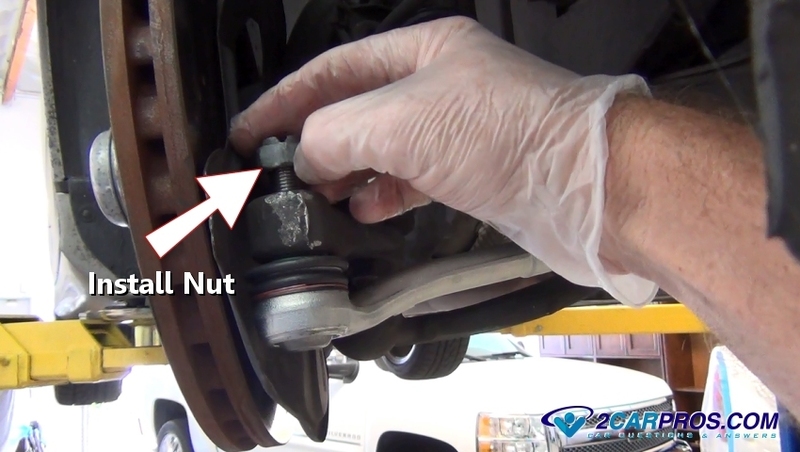 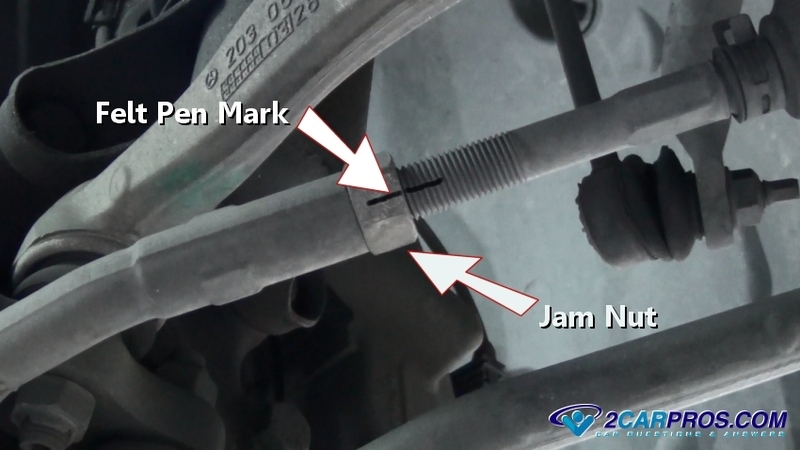 Step 5 - A jam nut is used to hold the tie rod in place and connected to the output rods of the rack and pinion or inner tie rods, use a felt pen to mark the position of the jam nut. Step 7 - Use a large pry bar to apply force and pressure downward. 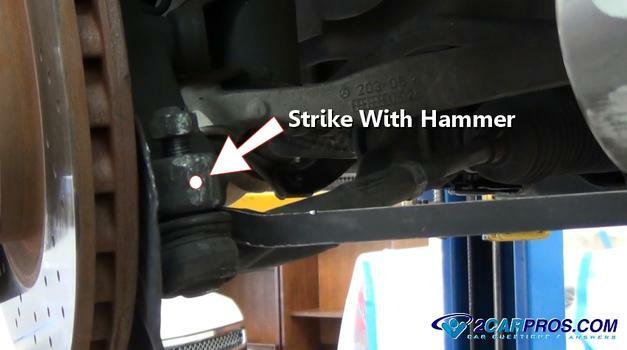 Step 8 - While holding downward pressure on the tie rod end, use a hammer and strike the spindle bulk head to "shock" the taper fit loose. 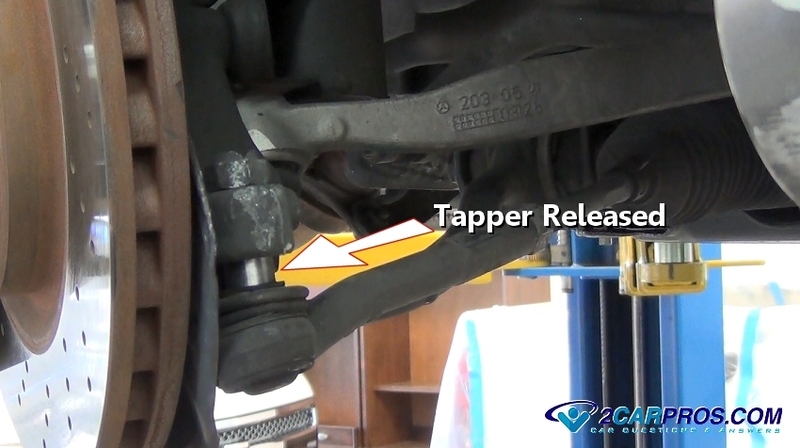 Step 9 - When the taper fit is released it will drop and show the tapered rod. Step 10 - Now, fully remove the tie rod nut. Step 11 - Once the nut has been removed the tie rod will become free and ready for removal, grasp the tie rod and turn either clockwise or counterclockwise depending on right or left hand threads. Step 12 - Match the old tie rod to the new unit, they should be identical. 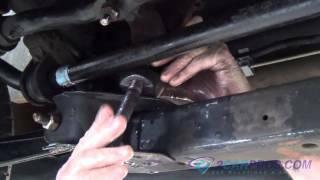 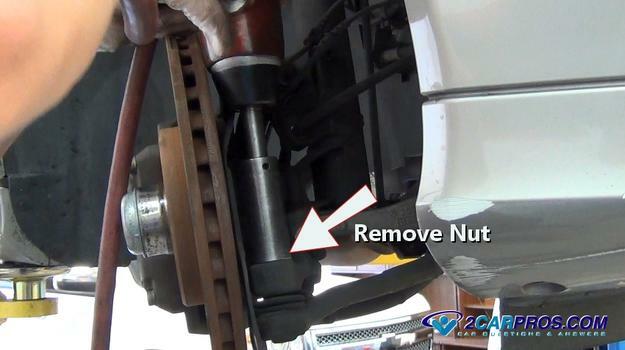 Step 13 - Carefully wind the new tie rod into place stopping when the jam nut has been contacted, be sure to keep alignment of the jam nut in place. Step 14 - Insert the tapered part of the tie rod end into the spindle bulk head. 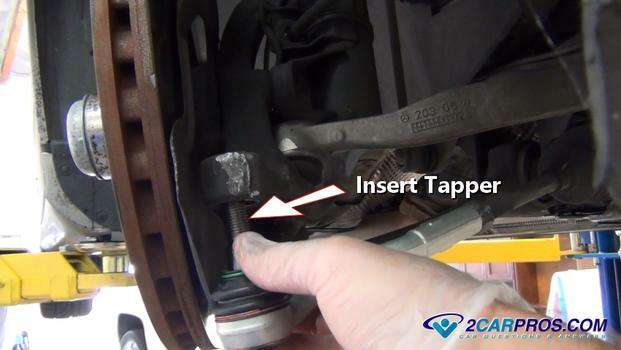 Step 15 - Use a small hammer, tap the tie rod end into place while setting the tie rod taper, this action will stop the stud from turning while tightening the nut. Step 16 - Thread the nut on by hand to avoid cross threading. 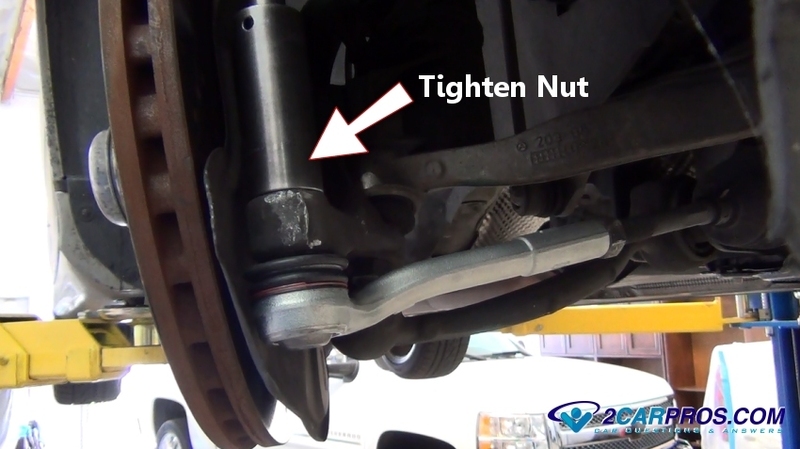 Step 17 - Tighten tie rod end nut securely. 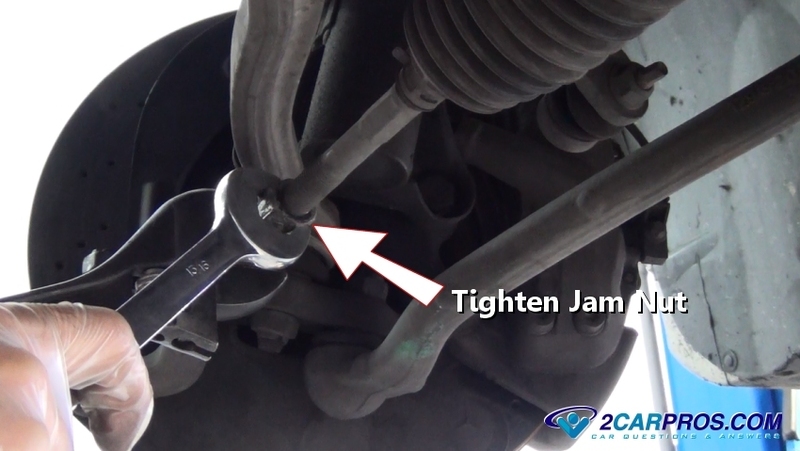 Step 18 - Snug and tighten the jam nut against the tie rod end. Step 19 - Reinstall tire while threading the lug nuts on by hand to avoid cross threading. 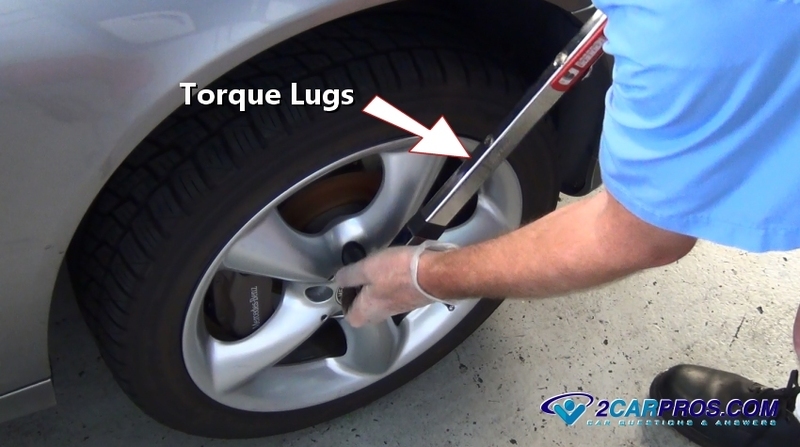 Step 20 - Use a torque wrench to tighten the wheel lugs to manufactures specifications (about 75 pounds) in a star pattern. 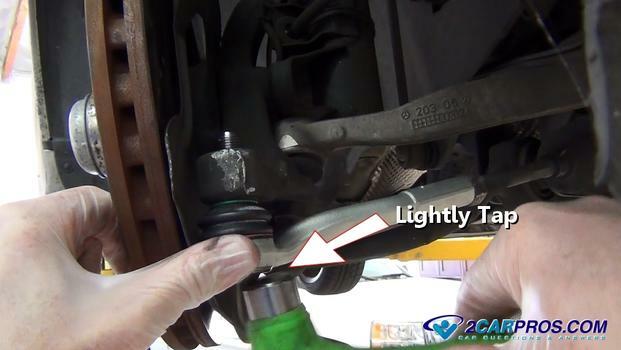 The front end should be realigned after the job is complete and test driven. 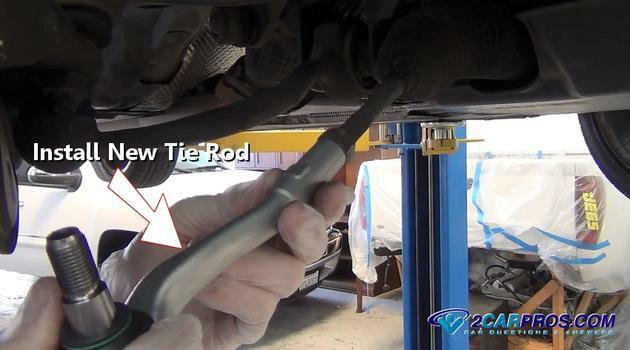 A tie rod end is normal maintenance item and must be replaced when worn. 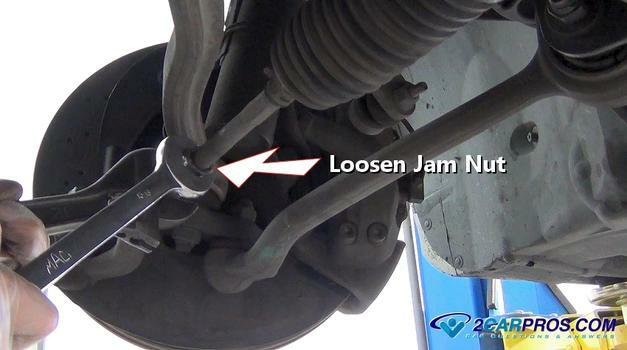 This component can cause front end noise and create steering wheel vibrations at highway speeds.